Cristina and George had a great July 2017 wedding! The ceremony was at Holy Family of Jesus, Mary, and Joseph in Niagara Falls. For photos we went to Haseley Farms and Wagner Farms in Niagara Falls and Sanborn, NY area. The reception was at Samuel's Grand Manor in Williamsville, NY. 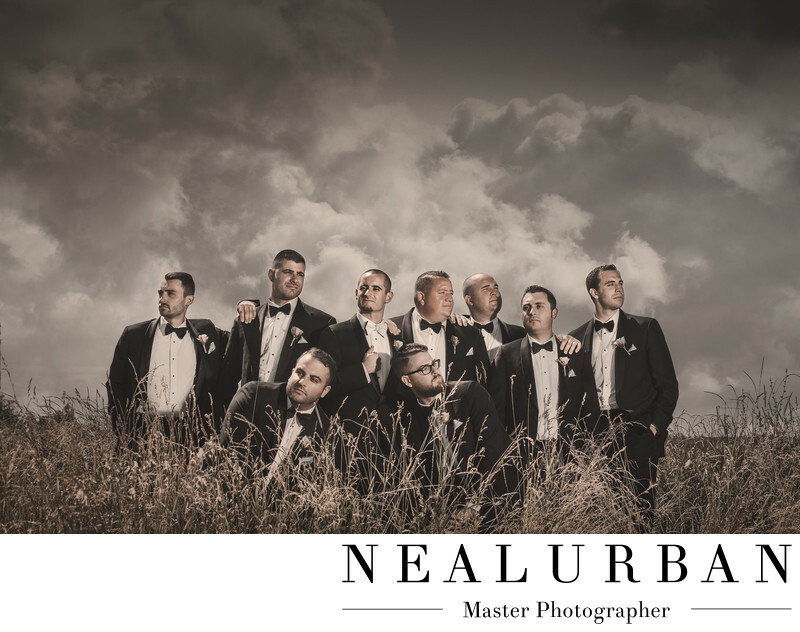 This image of George and his groomsmen was at Haseley Farms. The location was amazing! We were so happy it was a friend of the family! There were huge rustic barns, fields, and tall grass everywhere! Perfect for the guys portrait sessions. The groom and his groomsmen looked like they should be on an album cover! They had so much fun with this! They pretty much posed however they wanted! We only asked they look off in different directions. The sky was amazing! The clouds were awesome! Not too girlie! We try our best to find locations or areas that will work with the groomsmen or the bridesmaids. We want everyone in the bridal party to have fun and not dread taking photos. These guys had no complaints and had a great time! From here, we went to another family friend location at Wagner Farms to keep with the rustic them! There was nice contrast with apple trees! We brought the entire wedding party into the orchard! Then got some intimate images with just the bride and groom! Location: 3109 Lockport Rd Sanborn, NY 14132 United States.